Goes together like football and legal disputes, right? Wait, what? Well, late in regulation in Sunday’s NFC championship game, the New Orleans Saints were tied 20-20 with the Los Angeles Rams in pursuit of the Super Bowl. As the ball sailed toward Saints receiver Tommylee Lewis, Rams cornerback Nickell Robey-Coleman knocked into Lewis, appearing to make helmet-to-helmet contact. Officials called no pass interference or helmet-to-helmet penalties. As a result, the Saints kicked a field goal, then the Rams tied it up, and the game went to overtime – where the Rams went on to win, 26-23. “I don’t know if there was ever a more obvious pass interference call that … you know, that here it is, the NFC Championship Game. So, a tough one to swallow,” Saints head coach Sean Payton told reporters after the game. “We’ll probably never get over it,” he added. 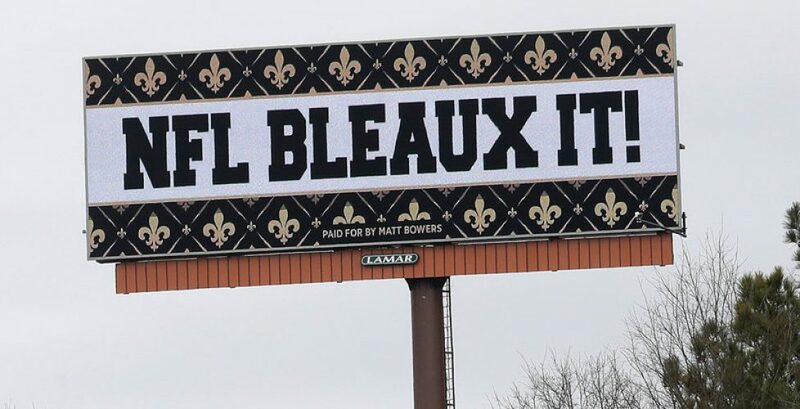 Payton wasn’t the only one struggling with the outcome: Saints fans are taking their fury with the NFL to court. Proof positive that there is nothing dumb or insignificant enough to not be handled by our court system. It’s the people really that cause the problems. And when you encounter them and those nasty disputes affect YOUR business like landlord-tenant matters, contract issue or even collections, call in your best sideline official, Dean Sperling, to resolve YOUR matter with YOUR best interests in mind!